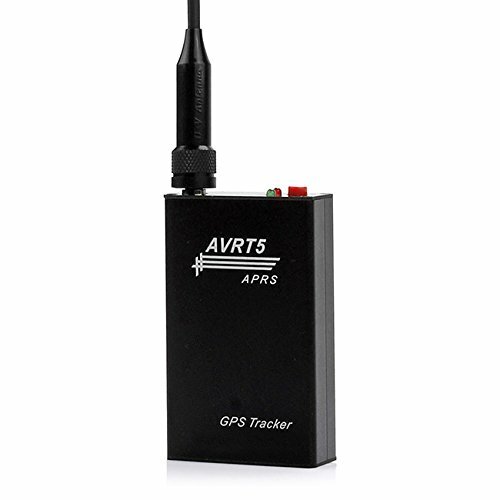 The AVRT5, also known as the AP510, is a mobile/portable 2 Meter APRS and Packet transceiver. It is inexpensive, and available on eBay and Taobao. It was first sold in 2014. Since the documentation and software that came with this device left a great deal to be desired, I’ve placed the results of my detective work here. I didn’t make or sell your AVRT5 and its software, so complaints about it go to someone else. But please email suggestions on how to improve this site to bruce at perens dot com. First, download and install the Visual Basic Run-time installer. This will install the Visual Basic 6 files that the configuration manager needs to run. Download the configuration manager. On Windows 10, there is a built-in ZIP archive manager, and you need only double-click on the downloaded file to open it. Older Windows versions may require that you install a program to extract ZIP files. Open the ZIP file, and drag the application to the desktop. The application file will have a long name starting with 2018, so rename it to AVRT5_config. Download the CH-340 serial-to-USB converter driver. After extracting or opening the ZIP file, click on the CH341SER application. Press the INSTALL button in the application. If it fails to install, you may already have the driver installed. The AVRT5 comes with a serial-to-USB adapter cable. The connection at the bottom of the AVRT5 that looks like an old-style mini-USB is actually a serial port. The cable contains a serial-to-USB converter. Plug this into your computer or power supply. The red light indicates that the battery is charging. Plug the serial-to-USB cable and the AVRT5 into your computer. Click on the AVRT5_config program. The application is not signed, so Windows is likely to complain about it. If Windows Defender presents a message, click on More Info, and then click Run anyway. The program will provide a selection of serial ports in a box that says Config. In general, the serial adapter cable that you just plugged in will be the last one, select that. If that’s not it, the program will probably fail, and you can try other ports. If your AVRT5 is turned on, hold down the red button until the AVRT5 beeps, and release it. It will turn off. Press the Read Config button. Immediately hold down the red button on the AVRT5 until it beeps, and turns on. You should see the configuration information loaded from the device in the application now. Set your callsign and any other data you wish to change, and then push Write Config. Here are some clues about the configuration screen. Click on the image to see a larger one. Put the unit outdoor or near a window, and turn it on. Locked GPS is indicated by a solid blue light. Nothing else works until the GPS is locked. Bluetooth won’t work until the GPS is locked. Disconnect the cable from the AVRT5 and turn it on to pair. For security, I suppose, the AVRT5 will not pair bluetooth while the serial (and power!) cable is plugged in. It must be running on its battery. Fortunately, it will connect to an already-paired device with the cable plugged in. Bluetooth won’t work until the GPS is locked. Place the device where the GPS will get a signal, and wait. The AVRT5 will be visible as a Bluetooth device called AVRT5. Its pairing code is 1234. The serial interface runs at 4800 Baud N81 (meaning no parity bit, 8 data bits, 1 stop bit). To avoid problems, you should have firmware version 20170403 loaded. The configuration program will display your firmware version once it reads the device parameters. You have a choice of firmware installation tools. There is a Windows firmware installer in the ZIP archive with the firmware, that will probably be the easiest one for you to use. The firmware file is in Intel hex format and can be installed using standard Atmel AVR serial firmware installation utilities, or the Open Source tools like avrdude. Connect the serial to USB adapter cable between the AVRT5 and your computer. Turn off the AVRT5, then turn it on and keep holding down the power button during the entire programming process. It should not normally be possible to “brick” the AVRT5, as the serial firmware loader is in its own protected section of FLASH memory. Hardware modifications that may be necessary to enable on/off with USB power and high-altitude mode. 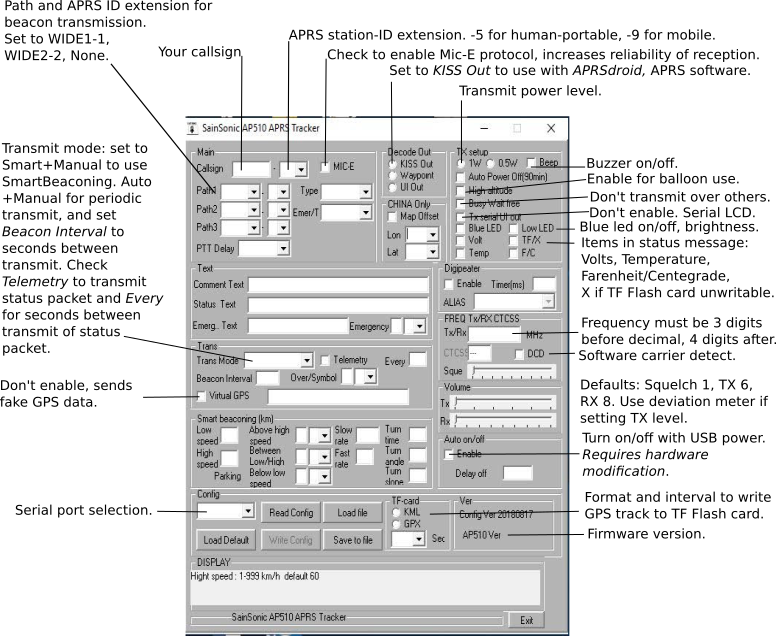 How you can load your own custom program into the AVRT5. Latest firmware (20170403) and Windows update tool. Configuration Manager for MacOS. The developer’s web site is f4hla.free.fr . Visual Basic Run-Time for Windows with installer for modern windows versions. *(Required for the Configuration Manager).